The Falooda Cup... : Love at First Dip! Yes from now on I can call myself a trekker. Surprised? I did my first full day trek! Even after a week I can feel the breathtaking moments flashing through my nerves as I write. Nagala North East One day Easy Trek! I took it up as a friend just invited me. Vishal said start from easy ones. Thats when I decided yes I am taking my first step in this path. The begining of being a traveller, a trekker, a fighter! I should thank Mr. Ponpandi for the musical ride in the morning. Bearing the unbearable stink near the tollgate taught me Tolerance. 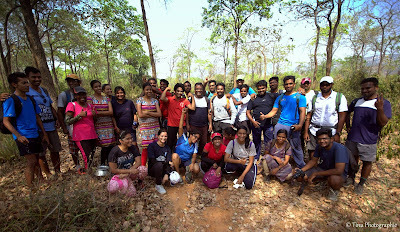 The travel resumed and we reached the foothills of Nagala only by early noon. The sun had no mercy to spare us. He was fully in love with our presence that he showered his rays like the fire dragon! The trek began with a few kilometers of steadfast walk with talks of getting to know each other. Stocked with lemons and water to fight dehydration I started to trek. 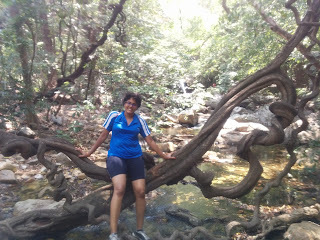 Having been into fitness regime for a few days, I thought an easy trek would be a cake walk. Well I did have my adversity points to face before I got the feeling that the trek was actually easy. The first four to five kilometers of hike to the stream was actually a test of my willpower. I stopped twice at the verge of giving up and had to push every obstacle in my heart with one single thought that the stream is near by and it's going to be heavenly. When I found small ponds on the way to the stream I jumped! I filled water to help me through my way. And every time I wanted to give up I pushed further and further. Finally we reached the stream! Ah that one heavenly moment in life. With heart pumping Joy a Scream! And all at once felt like living a Dream! This world is the womb that my mother gifted me tearing hers apart. This womb is a heaven to be explored till we breath and pass to what we don't know is next! Thinking across in these lines I uttered the words of poetry to my trek mate Vanathi.. Feeling the greatness of nature in its every bit I trekked further heights to the silver showers, tested my fears of swimming without rope and felt accomplished. It felt like I should do have such experiences again and again in life. As I trekked I did fall once or twice, I walked alone tracing paths, fighting fear and laziness. It was an amazingly euphoric experience to feel your will pop out like the beautiful water in the hills and experience it in its raw beauty to the fullest! I wish we trekked back the same way though the lazy part of me wanted to walk and not climb. It was fun walking back. It was fun talking stories, meeting new faces, motivated minds and relish the wonder of mutual existence and unity. To share and to lend hands of care! It was an over all wonderful first dip into the raw beauty of everything that was created for this baby of earth to enjoy in this Womb!